First Line: As Yardley LaMotte looked out the open door of the helicopter, he knew he wasn't a natural predator. Yardley LaMotte had a vision for the future and created the software that could make that vision come true. Greedy killers had a vision of making billions of dollars and stole LaMotte's software. Now all they need is the key to unlock the code. When they learn that a child attending one of LaMotte's school visits can probably break the code, the killers kidnap the child. The father contacts Tahoe detective Owen McKenna. McKenna learns where the kidnappers are holding the child and plans a daring rescue using a paraglider to drop out of the sky at night. But the plan goes very wrong, and it's up to Owen and his Great Dane Spot to save the child before the kidnappers can carry out their threats. Author Todd Borg has come through with the goods once again-- this time by paraglider. 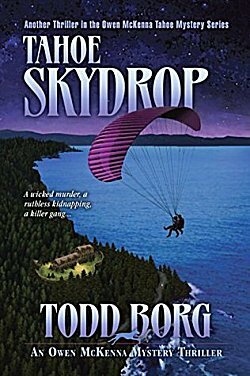 Tahoe Skydrop is another fast-paced story with plenty of great action sequences, but-- as usual-- this isn't a run-of-the-mill thriller. While you're trying to figure out how in the world Owen McKenna is going to save the day this time, you're also effortlessly learning fascinating facts about the software business, venture capitalists, and bitcoin. If that's not enough for you, there's the breathtaking beauty of Lake Tahoe that Borg describes so well. And if that's not enough for you, I saved the best for last. Todd Borg has created one of the best casts of characters in crime fiction. Owen McKenna is a former San Francisco homicide detective who has an excellent working relationship with the various law enforcement jurisdictions in and around Lake Tahoe. In each book of this series, you learn more and more about what a good guy he is. (If he were real, I'd be tempted to fight his girlfriend Street for him.) You can see he's a good guy by the way he treats everyone, but in particular Street, an intelligent, fiercely independent woman who has definite ideas about how she wants to live her life. In this book, you can see what a good guy he is by the way he treats a dog that's trying its best to tear him limb from limb. The people involved in the investigation also come to life. Yardley LaMotte, the man who thought he had the world by the tail until he came face to face with Job's Sister. Yardley's wife, who knew her husband didn't have a good grip on anything. He-Man Vince Cooper is the kidnapped child's father, and there's nothing he won't do to save Jonni. Jonni is the kidnap victim and is yet more proof that Todd Borg has a knack for portraying smart children. Then... there are the characters you assume you can take at face value... but don't. More than one of these characters have surprises up their sleeves. And I haven't even extolled the virtues of my favorite Harlequin Great Dane, Spot. Spot isn't written as Super Dog. He's not faster than a speeding bullet, and he's not going to come racing into the kitchen to spell h-e-l-p in the mashed potatoes. He's just a very large dog that's very well trained and has an unbreakable bond with a good guy named Owen McKenna. Never underestimate what these two can accomplish. If I still haven't persuaded any of you new-to-Borg readers to give Owen and Spot a try, I'm just going to have to keep at it because if you haven't read Todd Borg, you're missing out on some wonderful books. You have been warned! No convincing neeeded here Cathy, I'm a long time fan of Owen and Spot ! I've just downloaded this and can't wait to dive in.. Always good to see another Owen/Spot fan, Deborah. Enjoy the book! Hmm....It seems resistance is futile, Cathy... This one has a really interesting premise, too. And it sounds like a person could start here and enjoy the books without having read the rest of the series. That's a 'plus' for me. What Margot said...I've not read any of these - not sure why - but, could one start here? Also, since there is a great dog involved, I'll mention the author to our mystery group. Lots of dog lovers there. And by the way, I just discovered that the first book in the series is free on Amazon. Not because of Kindle Unlimited, but just free as an e-book. You can start here if you'd like, Kay, but oh, all the good reading you'd be missing if you do! I have read the first 3 books in the series. It is a series that I always want to get back to even though I have many other books to read. I haven't been disappointed in any of the books I have read. I looked ahead at the rating of the upcoming books and they all are rated high. There is always a good plot, great characters and oh, the location. It has become one of my favorite series. I'm so glad to hear this, Lynn. Denis and I visited Lake Tahoe a couple of years ago. For me, it was a revisit, and it was even more beautiful than I remembered. Another series (sigh). And for dog lovers, too. It's a sigh for the TBR lists which are so long that it takes forever to scroll down the pages. But one glitch: my library only has one of his books. So I'll have to see where I am with my lists. I'll have to content myself with dog lover, David Rosenfelt's, new book. They're light, witty, a bit of legal issues and dogs. I need to read more Rosenfelt. Gosh, yes. And if you want to read a hilarious nonfiction book by Rosenfelt, read Dogtripping. It's about his and his spouse's trip from California to Maine with 25 dogs, 11 people and several huge vehicles so the dogs could rest during travel. He was moving and since he and his spouse rescue dogs, they had to move them. Interspersed with the moving sections (hilarious) and photos are vignettes about various dog rescues. He had to go along with her or else she would have brought home 30 dogs. As it is, they lived with almost 40 in a big house. They set up a foundation and rescued 4,000 dogs, mainly Golden Retrievers, found homes for them and kept elderly or disabled dogs. But then they went to shelters and rescued dogs -- her idea. His website and Facebook pages also have great photos of the trip east. So much fun, yet sobering about the rescues.